Bear Mountain is the highest peak in CT (but not the highest ground) and offers stunning 360 views. Left CT and entered Massachusetts at mile 1506. Mt Race was a fantastic .6 mile ridgeline walk, which we experienced first thing in the morning. Mt Everett was a bit of a challenge but the Jug End provided more views. Footbridges and streams led to the Shay’s Rebellion Monument and Great Barrington, MA. 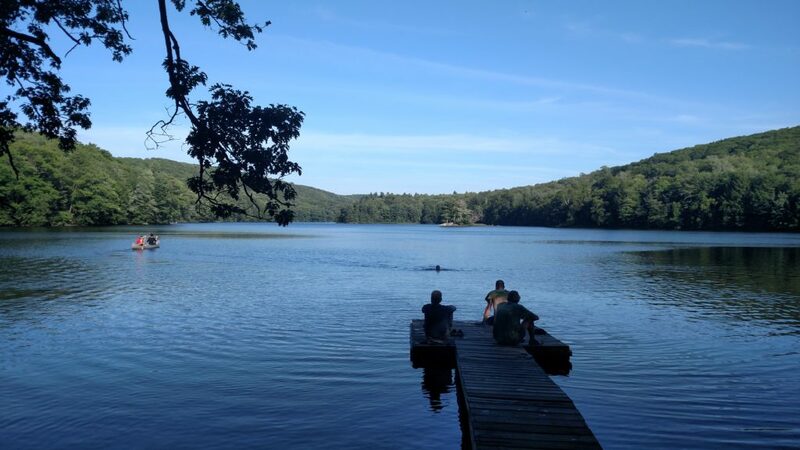 We crossed the Housatonic yet again and briefly entered Beartown State Park. Upper Goose Pond Cabin was a highlight, not only for the scenic beauty but also the food! Walling Mt had great views but Warner Hill has views and blueberries. As thru-hikers, we indulged in Dalton and Cheshire on the same day! The Cobbles provided our first view of the Hoosic River and Mt Greylock, the tallest in Massachusetts. We stayed halfway up and finished the next morning in the fog. The AT drops all the way back down to the Hoosic River and then back up to the state border of Vermont. The AT and Vermont’s Long Trail are concurrent for the following 105 miles. Vermont is picturesque with piney forests, flowing streams and nice views. There are some climbs but most are gradual. Porcupine Ridge made for a challenging afternoon up to Glastenbury Mountain. The views from the lookout tower were stunning- nothing but pine trees, mountains and clouds. We are so relieved to be back in the wilderness and away from so many roads and towns. Stratton Mountain had a similar view and is said to be where Benton MacKaye found his inspiration for the AT. From there, we dropped down to Stratton Pond. Bromley Mountain allowed us to sleep in the ski hut and we enjoyed the sunset from the ski lift platform! Styles Peak, Peru Peak, and Baker Peak were next and Little Rock Pond awaited us on bottom. The last major challenge of this section was Killington, a popular ski destination. Gorgeous! The Devine’s (Claudia’s cousin, Heidi & fam) live in Connecticut and scooped us up for a few nights. 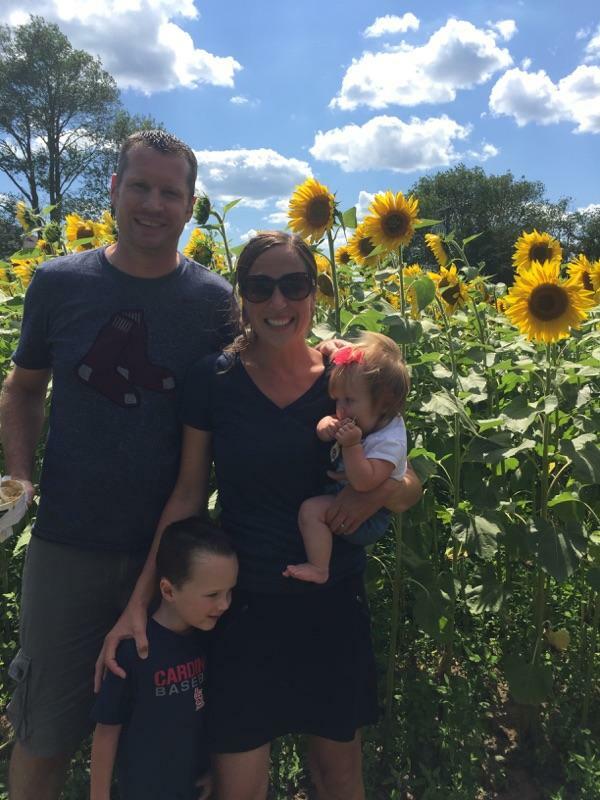 We enjoyed home cooked meals, snuggling with the kiddos, playing outside, and visiting local favorites such as Buttonwood Farm (ice cream). Meeting Claudia for the first time was such a delight and Harrison wasn’t shy for a minute! Devine’s! Love spending time with family along the way! Buttonwood Farm grows sunflowers for the Make-a-Wish Foundation every year. We have started crossing paths with Southbound hikers (SOBOS). Most of them started from Katahdin in June. It’s fun to trade stories and trail information with them. We’ve gotten some great tips on where to stay and eat, and which side trails are worth that extra 0.4 miles. Long Trail Bubble: Vermont is beautiful! It is great to be in the mountains again, with their cool temps and wide open views. The Long Trail goes all the way through Vermont, from the MA border to Canada. The AT and the LT overlap for the southernmost 100 miles and this is a popular time to start the LT with it being the end of biting fly season. Our first few nights in Vermont, we saw crowds as big as we had in GA! It’s fun to meet new hikers, but we did more stealth camping to avoid the crowded shelter areas. We study our guidebook so much, sometimes it feels like we can pick our path for the day. In reality, our path has been set in white blazes from day 1! If I could choose, I would go for flat ground over a 2,000 ft climb any day. Being forced back into the mountains by the white blazes of MA and VT, I’ve realized mountain climbing is worth it! It’s easier to do a 20 mile day on flat ground, but a 12 mile day in the mountains gives us a challenge to overcome, and amazing views as a reward. We always want the easy path, but being forced into a harder one gives us better stories. We stayed on top of Bromley Mountain in a ski hut! There is no water, so we had to carry 6 liters up from a spring down the trail. We had a spectacular 360 degree view on top, and after the sun went down we could see the milky way! This was the best stargazing since Max Patch, NC. On Killington, there is a side trail 0.2W to the summit. We had only seen a hand full of hikers all day, and the side trail was basically a rock scramble. Imagine our shock when there were crowds of families with kids on flip flops at the summit! What?? We didn’t realize the gondola for the ski slopes runs in the summer, bringing folks up to view the summit without breaking a sweat. The Green Mountain Trail Club was out doing trail work as we descended Killington. We passed a woman crushing rocks with a sledgehammer, two men moving a boulder with steel rods, and a group that just finished putting a new step in place. Lollygag was the first hiker to use the step! We are amazed by the amount of labor that has gone into making the trail. It was nice to be able to thank the volunteers for their craft in person. 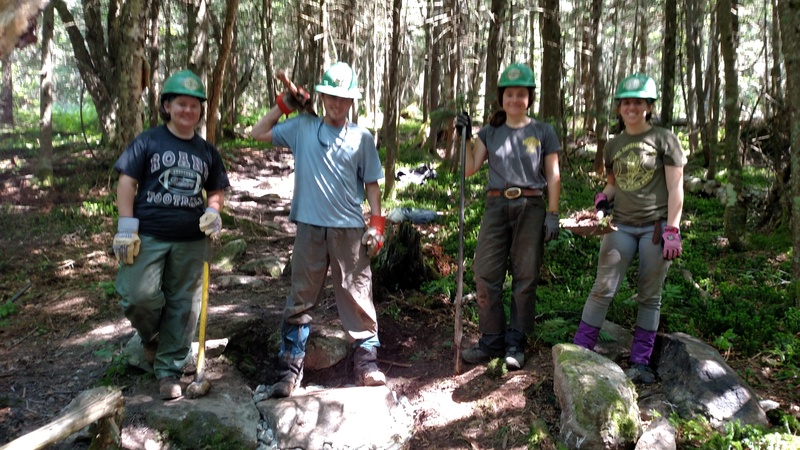 Green Mountain Club trail crew— thanks a bunch! Backpacker version of our favorite meal after a day on the ski slopes. Claudia whipped this up on a ski lift platform on Mt. Bromley. Sautee squash, peppers and onions in olive oil and set aside. Cook Velveeta shells and cheese according to directions and add back the vegetables. Ingredients: Swedish meatball seasoning pack, 2 packs instant hashbrowns, dried leeks. 1) Mix leeks and meatball seasoning into dry hashbrowns. 2)Add boiling water to hashbrowns. 3)While hashbrowns soak, prepare gravy according to directions and set aside. 4) Fry hashbrowns in 4Tb olive oil. 5) Serve hashbrowns topped with gravy, add more olive oil to taste. We have decided the red eft is our official wildlife mascot of the AT. We started seeing them in NC and and they are still around. Lollygag still feels the need to photograph them from time to time. He could publish a 365 day red eft photo calendar with all the pictures! Toads are common, and vary in color from orange to brown to reddish. We are seeing fewer snakes, mostly ribbon and garter snakes. We had a bear cub sighting in northern Mass. It took one look at Lollygag and clambered up the nearest tree. We didn’t stick around long, fearing Momma Bear would show up. Near Bear Mt in CT, we had a falcon fly right in front of us! It was soaring, and tucked it’s wings to dive as it passed. Amazing! One night while cooking dinner, a mole came out of a hole, looped around us, and entered a different hole. To our surprise, it came out of the first hole again, and again! Or maybe it was a mole migration. Upper Goose Pond is one of the best spots! Volunteers make pancakes and coffee daily! It’s .5 off trail but worth every step. Cookie Lady off of Washington Mt Rd (mile 1559) is a must stop! 3 cookies per hiker plus water and berries! Be respectful of other hikers… NOBOS and SOBOS and section hikers and Long Trail hikers each form separate tribes… try to learn from one another and appreciate what the other is doing or has done. It was so good seeing you & spending time together! We loved every minute! See you in New Hampshire!! Be safe & we love you! I really do know how to spell my name. How do I edit this?! Haha! I’d never heard of a red eft and had to look that up. Handsome. Thanks! We see the red efts everywhere! We include recipes with each blog- subscribe! Love reading about your AT adventure! Great update! Thanks for bringing your adventure to an envious armchair enthusiast! 🙂 !